. . . the easy way. Like all my quilting ways and means, this is the shortest route to the end. 1. When you're finished quilting, trim the extra batting to be even with the quilt top. Be careful with the scissors so you don't cut through the backing (ask me how I know). Then trim the backing so that there's approximately an inch of margin. Look at my inch. It's not exact or even--it's actually ragged, but it's close enough for this approach. 2. When all is trimmed, fold the back in so that the raw edge meets the edge of the quilted top. Then fold that folded edge in over the quilt. Now everything is tidy and nice. Pin it in place. Do the whole side. 3. All that's left to do is to slip stitch the folded edge in place. Slip stitching is practically invisible and is very easy to do with a little practice. See how the needle travels under the binding, but not so far down that it pierces through the back, then comes up again very close to the folded edge. Then it goes into the quilt just a tiny tiny bit, so that the stitch hardly shows. (Feel free to google some better instructions!). I treat the corners quite simply--I go down one whole side, then turn the quilt and go the next way. I don't mitre or do anything fancy. And that is the Unambitious Quilter's guide to binding! You are my kind of quilter!! How bout a running update? Any spring races on your calendar??? Thank you so much for posting this. I'm now much more confident about finishing the quilt that's been lying around for so long. 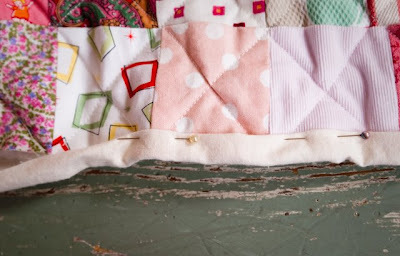 I'd never even thought of using the backing to bind a quilt; I've always cut binding strips, joined them, sewed them on, then hand-sewed them down--and it takes forever! I have a quilt waiting to be finished, and I'm going to try your method instead. Thanks for posting this! I really like how easy and pretty it looks. I like your blue quilt the best. Thanks, Anna - I've been wondering about this part of it. But for Giles' quilt, I think you said you made a strip of scrap fabric to bind it with - so, is that method also done by hand? Thank you, now I feel like I can do it -- was dreading the binding! I really, really like your style! That's the way I do it. Usually by the time I get a quilt to that stage I'm just ready for it to be done so I can look at it and sigh. But, really, I think it blends the backing into the front of the quilt for a more seamless project. That's how I justify it anyway - good job!! I've always wanted to make a quilt. Maybe one of these days, I'll try it. I'm about to (in the sense that I've been about-to for over a year, but now I really mean business, lol) cut down a quilt (Lands End, nothing vintage) that is too big now that we've stopped using our Victorian reproduction bed, and this is very timely! Any chance you could post a pic of a corner, front and back would be great? My mother used to crank out quilts the way you do and I never got lessons from her and now I'm winging it it, so I appreciate your posts so much! That's how I've done binding on the baby quilts I've done and it's tremendously easy. Now I need to learn how to piece. 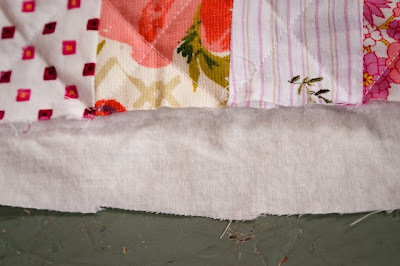 I am in the process of making a binding just like that on my little lap quilt. I'm so pleased we're doing the same thing!! Hey...I'm so glad to have validation that this is an acceptable way to bind! Like Thirkellgirl, I too would love to see a picture of a corner and the way it looks in the back. This method seems so much easier, I just may start a quilt soon! Nice tips there, thanks for posting. I will try this way when i make my next quilt! I'm curious to know what the "unambitious quilter" recommends for batting! smart! I might try that next time! 1. cut 3-4" wide strips (I don't bother to make them bias). Sew together to equal perimeter of quilt. 2. On right side of quilt, with right side of binding down, machine sew one side of the binding the whole way around the quilt so that when you fold it around to the back, no stitches are showing. 3. On the back, fold under the raw edge (can iron it down before you sew on if you remember) and do the little hidden stitch that Anna described. Thank you for sharing...now finishing a quilt is not so daunting. Thanks, Margo! It will be a while before I get to that stage - haha. But I'm collecting fabric; it's progressing! Oh thankyou, that to me was the scariest part. Not to be too negative but this method of binding does not last very long and wears out quickly. After putting so much work and money into a quilt, why skimp on the binding?? I just used this technique today! Thanks for posting instructions, it is so much easier than using binding strips. Used my machine instead of slip stitching. Worked great! Well, I'm a gay atheist but I love you now! 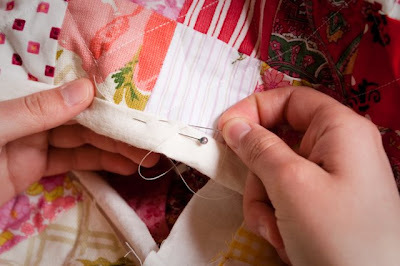 Thank you so much for this common sense way to bind a quilt by hand.